Exercise is an essential part of managing arthritis and minimizing the pain associated with the disease, according to the Arthritis Foundation. Instead of increasing joint pain, regular exercise increases flexibility and reduces stiffness. An exercise routine that includes an exercise ball for arthritic hands can build up the muscles around the joints and decrease the amount of inflammation the disease produces. You should start any new exercise routine slowly. According to the Arthritis Foundation, many people fear trying new physical activities because they already are in so much pain. Getting over the initial fear of increasing that pain involves taking the ball in hand and squeezing very gently a couple times. As the pain recedes and your fingers become stronger, you can add repetitions to reap additional benefits. Exercise balls that provide a stronger level of resistance can help to build muscles in the hands and relieve the pressure on arthritic joints. The effects also will show up in the increased range of motion you'll experience after exercising your hands. Simply bend your fingers slowly and squeeze the ball as hard as you can without causing pain. Hold the squeeze for a count of three. Repeat the action five or six times and rest. Hand exercises for people with arthritis are best performed in small increments several times a day. 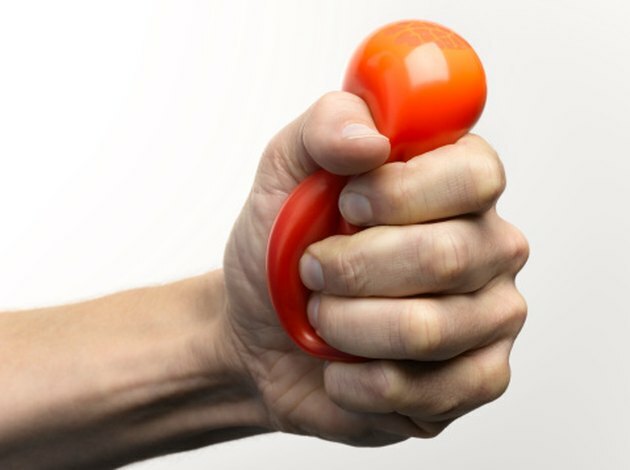 Stress balls are available at a number of outlets online or at fitness retailers. Options can provide the same movements without the need of a special ball however, according to The Ohio State University Medical Center. Try performing the squeezing techniques with a piece of paper, a towel or piece of fruit. Start with an 8-inch by 11-inch sheet of paper, crunch it up and squeeze, and them move to a page from the newspaper. You also can perform the exercise with nothing in your hand. While you won't get the strength-building effects provided by an object, you can still benefit from the flexibility training. Performing hand exercises with a ball can cause additional problems if you use improper techniques or inappropriate ball densities. According to the Arthritis Foundation, you should consult your doctor before starting any new exercise to make sure it won't interfere with any other ongoing treatment. You then can get directions and guidance from a physical therapist or occupational therapist who can inform you of the proper methods to use a hand ball and what signs to watch for if you are doing anything wrong.